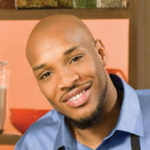 Chef Darrell ‘DAS’ Smith – celebrity chef, author, and teacher was born and raised in Ypsilanti, Michigan where he learned most of his cooking skills from his mother. Chef Das’s commitment to sharing his love for food through education, his invigorating energy, and his undeniable ability to attract an audience of young adults led him to create and helm a one-of-a kind culinary arts program at Beverly Hills High School. Among some of Chef DAS’s crowning achievements include being hand-selected to cook for the First Lady of the United States, Michelle Obama, at her annual luncheon. Chef DAS has starred in several episodes on the Food Network’s hit shows “Next Food Network Star” and “The Great Food Truck Race”. He is one of only a handful of chefs to serve as a recurring expert on the Oprah Winfrey Network’s hit series, “Home Made Simple.” Chef DAS recently had the privilege of calling multi-millionaire entertainer and entrepreneur Sean “Diddy” Combs boss for two years as his full-time personal chef. Because of this passion he is dedicating much of his time to create additional educational programming through books, seminars, television and more.